If you love table tennis and you already own a table, you only need to use ping pong robots to perfect your skills. One can be enough, but there are those used while you are a beginner and others are appropriate at expert levels. Also to that, they are in different shapes and sizes with varying amounts. It is hard to determine the best one and why they may be worth spending much for them. 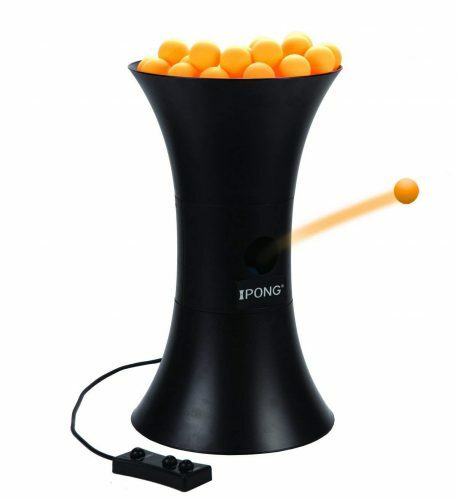 Therefore, we searched and compiled a list of the best ping-pong robots. Read all the details below. Are you new to playing table tennis? 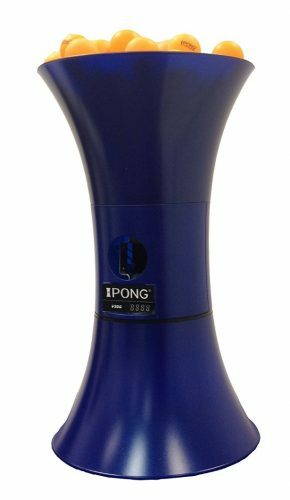 This iPong Mini is an ideal practice partner for you. If you have no friend to play with, you do not have to fold the opposite half of the table. This robot will help you gain experience and give you fun as well. This robot has a simple design with a trajectory hole at the bottom half. The logo of Pong mini is indicated below the hole. You do not have to worry about set up since it does not require any assembly. It uses 4-AA batteries and a simple on and off switch. This ping pong robot takes your tennis game to a new level of recreation. It gives you an option to determine the level of play you need, unlike many ping pong robots. Let’s look at what makes it outstanding. The design is the same with the iPong mini. The only difference is its features and placement of trajectory point. You can have a world-class training by easily regulating the pace you can work with. Before reloading, it can cast 100 balls continuously which makes it good for practice. You can select heavy topspin, topspin or backspin using a wired remote while still standing on your side. It is easy to assemble and requires no extra hardware. 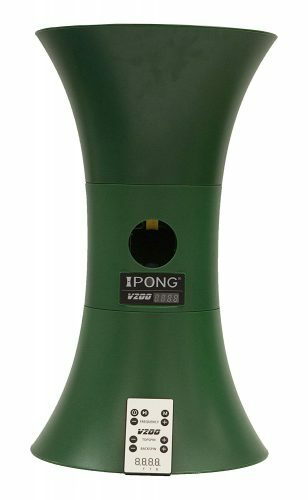 When it comes to the best ping pong robots, iPong V200 cannot go unmentioned. If there is a shot you are repeatedly working on, this robot helps you by saving the command. 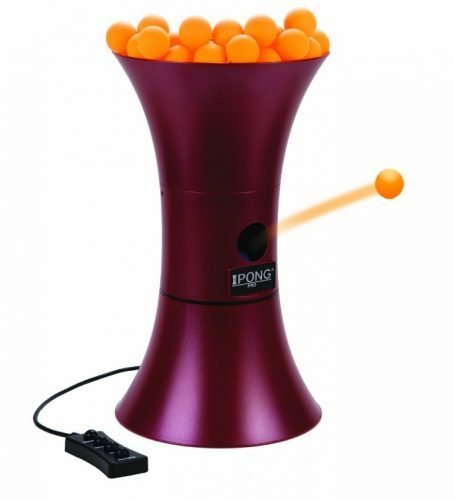 This device has been built with a capacity to hold 110 balls, and its frequency can be adjustable within a range of 12-70 balls per minute. It is unique from other ping pong robots since it has a memory button to save a specific setting and also to pause or pause. You can change the settings using a remote for endless shots with nine levels. Although this device was designed in America, its craftsmanship is in China. With more consistency and accuracy, iPong PRO will improve your gameplay when you face a human opponent. There is an oscillation feature to help you practice with more robust challenges. It has a simple and elegant style just like most ping pong robots. More ever, it has a feeder disc design which makes sure that there are no ball jams. 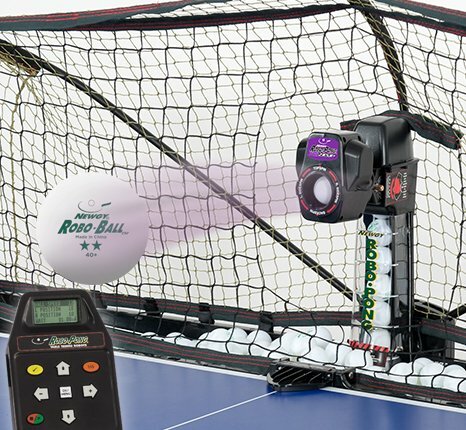 You can control the ball shoots per minutes ranging from 12 to 70 balls. Both the power, oscillation, frequency and spin can be controlled using a wired remote. 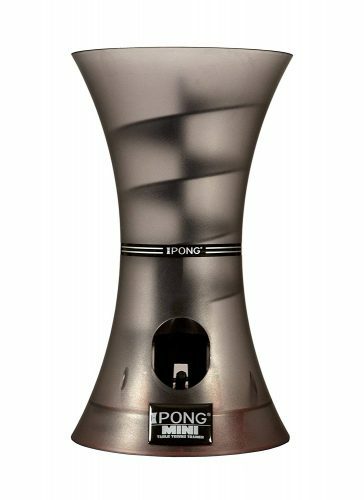 For the love of the game, this Robo-Pong 540+ gives you fun as well as additional training. It has been improved to ensure more balls can be handled. The features are fantastic for such an affordable ping pong robot. Also, the design is great as you are going to learn below. 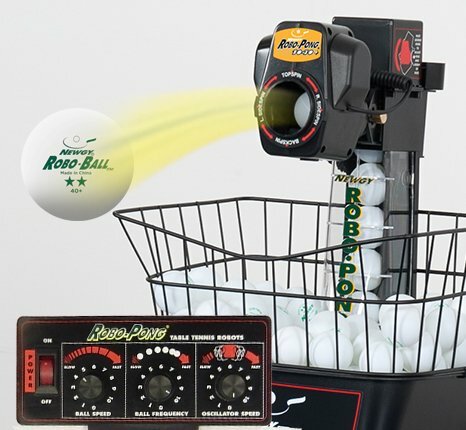 This device can handle 40+ balls and hold an average of 90 balls. To regulate the frequency and speed, it uses analog controls. 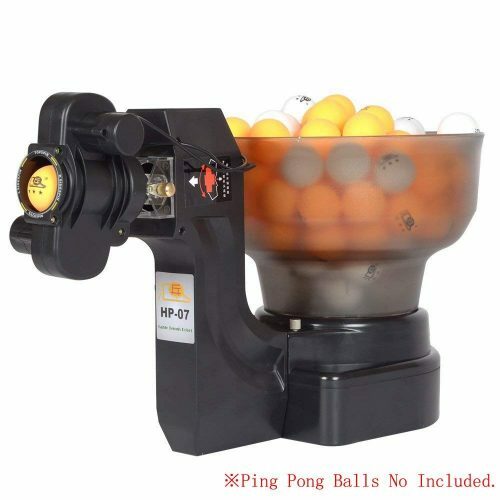 When you purchase it, you will get a ball thrower, four dozen orange 40mm balls, ball bucket, analog control and a manual. 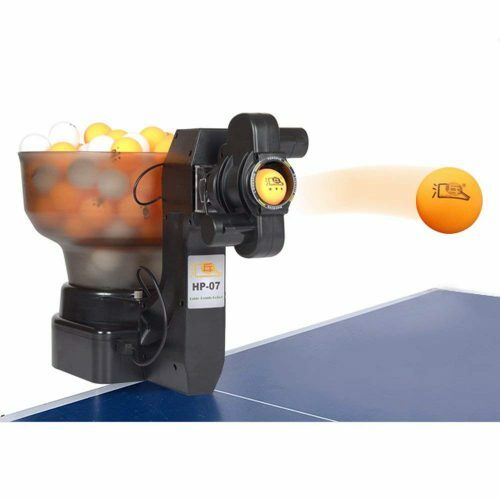 In order to improve your accuracy and hit like a pro, we recommend this ping pong robot for use during practice. It is fun and easy to carry it wherever you want to play from. It can release 40-70 balls per minute with a speed of 4-40m/s. The frequencies can be adjusted to allow you to play at the desired pace. It can hold more than 100 balls of 1.57 inches. This design also allows you to adjust the machine’s position. With this device, learning how to play with ping pong robots is a piece of cake. It can be used to train beginners too since its pace can be adjusted. Its capacity to spin balls will exceed your expectation. It has an impressive design that is simple and common. The swing speed can be adjustable from 0-5 levels. The whole device can be located in different positions to suit your play. 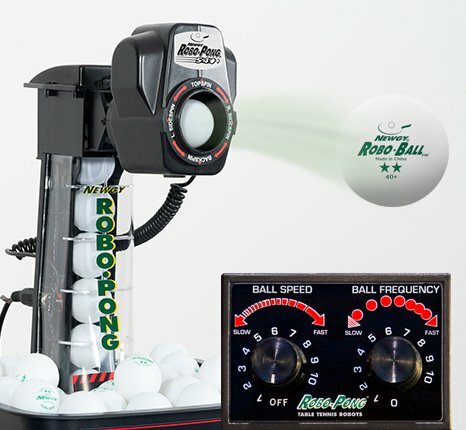 Rotary ball control can adjust the frequency of the balls from slow to fast when you move it from left to right. It can handle 110 table tennis balls when full. This is one of the few ping pong robots with consistency and accuracy software. That is why we recommend it for you. The more unerring the machine is, the more you are likely to beat your friends when they need a challenge. And who would not wish that? The machine’s design has mainly focused on motor and shooting wheels to increase their consistency and accuracy. Its ball frequency ranges from 12-70 balls per minute. To prevent ball jams, it has a feed disk design. You do not have to worry since it has an improved wireless remote to control from a distance. The performance has been increased to long-term due to its high quality. Have you lacked enough time to play due to congestion in a training facility? Maybe you have been waiting too long to get a chance. Well, this machine can solve your problems at home. It has incredible design and features as indicated below. Although it has an adorable design with an upgrade to handle 40+ balls, you will need to use its effective analog controls. Therefore, you can adjust oscillations, frequency, and ball speed effortlessly. The bucket can hold over 200 balls with extender cage, which can be used to play for a few minutes non-stop. When you buy, you will receive the robot, ball bucket and the cage, 48 orange Robo-balls, analog control panel, and a user manual. This is an advanced robot for serious table tennis players worth spending on. With precision for ball frequency, placement and speed, it makes sure you are well trained. It is designed to challenge you as well as make table tennis interesting to you. Different game modes are selectable. For simple manual control, the normal mode is there for you. If you do not want a regular or predictable challenge, use the random mode. Also, there the drill mode presents to you ready programmed drills, 64 in total, for different playing levels. You can create personal drills if you want to. It comes with the robot, recycling net system, set-up DVD, 48 Robo-Balls, digital control with six languages, and a training manual. Relying on people and recreational centers can be devastating when you need to engage more in table tennis training. That is why you need ping pong robots to assist you to achieve speed and accuracy. These machines are better than human trainers who are prone to getting tired and not delivering the same results. 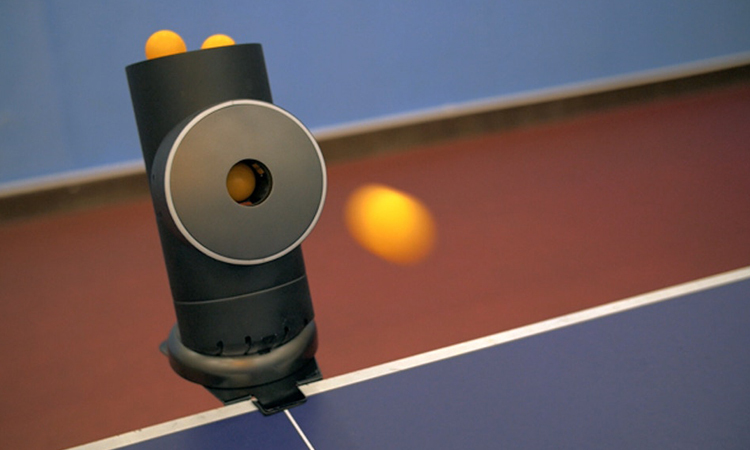 Frequency can be adjusted in most ping pong robots to have different challenge levels. They have different capacities among other features. Now that you have the best robots for the job from our list, you should purchase one and take your table tennis skills to a new height.